A bag to prevent backpain. A speaker that cools your drinks. A drone that delivers emergency supplies. Trainers that play music and generate energy. Adaptations for hearing aids to make them look more attractive for young children. These are just a few of the ideas coming out of Imperial College London’s new space: The Invention Rooms. The zone blends an advanced university hackspace with a community engagement area and a unique “Reach Out Makerspace” for local young people. Based at Imperial’s new White City Campus, the Maker Challenge pioneers a new form of outreach aimed at inspiring young people from hard-to-reach backgrounds to interact with science and technology through their own creativity. Armed with 3D printers, laser cutters, textiles, craft materials, wood and metalworking machinery, participants can engineer prototypes for just about any idea they come up with. 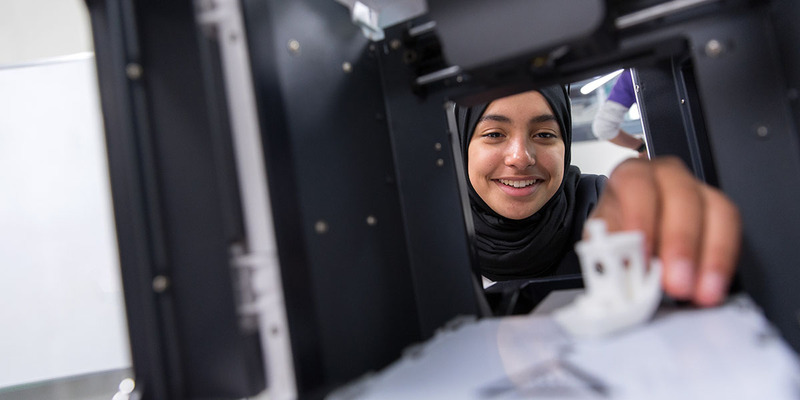 Makerspace Program Coordinator Kate Mulcahy launched the first cohort of 14- to 18-year-olds in September with about 20 teenagers, a third of them girls, from eight schools across White City. “Some of the students are now starting to think about their final projects, and we have some diverse and ambitious ideas,” Mulcahy said. “One of them is working on scale prototype fire safety system for tall buildings, where in the event of a fire, foam is ejected from the base of the tower allowing people to jump to safety. Of course, this was a direct response to the Grenfell tragedy which is within sight of The Invention Rooms and has affected all the students in some way.